I love how these look natural but really add length. I don't like how the price is more depending if you live in a small city as that is a bit unfair. How have I just discovered your blog Natasha? This is such an incredible review. I had this done around 3months ago and they still have a little lift, love this treatment. These look amazing! I used the finder and found loads of places that do this in my city so think a treat is needed when I head back there this weekend! Your lashes look amazing. wow what a difference! Your lashes are beautiful to begin with but this really adds to them. Wow! Natasha your eyes look amazing! And the effect is so natural too, you must be so pleased with it! I am impressed that such a high quality treatment doesn't have a £100+ price tag as well - I may look into getting some LVL lashes of my own! Thank you for sharing your experience in such detail! Really pretty! I don't think I could do it because it would feel odd to me. I don't like a lot of stuff going on around my eyes. I rarely even put mascara on. But you look great! Wow your lashes look great! I love seeing real reviews like this because I always think those products don't work. Did you feel your eyelashes getting longer? Or did you just see the difference in the mirror? You can see the difference from the moment your technician passes you the mirror! I was sitting there like, 'THEY'RE MY REAL LASHES?!' it really, really enhances and lifts your lashes. You see the difference. I feel like it'd feel pretty strange. I've worn fake eyelashes twice before (to two of my best friends weddings) and it just felt weird having something in my eye area. This is awesome! 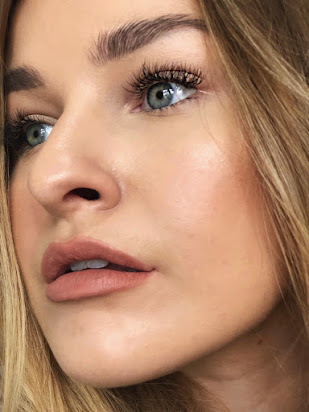 I've heard of LVL but never had it done; I did get lash extensions a while ago and wear individual fake lashes on a fairly regular basis - but this looks absolutely amazing and it looks so beautiful on you! Thanks for sharing! They look fantastic! I have THE shortest lashes ever- somehow both of my kids have long lashes, must get them from their daddy. I'll have to look into this over here across the pond! So beautiful!! I would love to try this! I spend so much money on a variety of mascaras trying to get my lashes to look longer so this would be great! Awesome review. How interesting. I've found that my lashes aren't as full as when I was younger. I'll have to check this product out! Me too. I think it may be from wearing mascara every single day!! This was a great review! I've had lash extensions before but never heard of LVL. Yours came out great! Your lashes look incredible!! I love seeing before & after pictures of LVL! Thanks so much for linking to my video - it's so interesting to see what happens while you have your eyes closed ha! It's crazy how much the prices vary, I always assume London is more expensive but I've found that most beauty treatments are more expensive elsewhere.. It kind of makes sense though. Unfortunately because my lashes are so stubborn and this is the only thing that works, I probably would pay £60 for it. Eek! Wow, what a difference this makes. So pretty. I've been thinking about getting lash extensions for a while now but this sounds like a much better option. Wish I lived in London so it was more affordable though! Such a great in-depth post! I would love to have this treatment but not sure if any of my local salons do it as I live in such a tiny area. Your lashes look fabulous!! I was blessed with long and full lashes but will sometimes add some fake lashes for special occasions. This is a great alternative. Oh this is so exciting to read as I'm getting mine done on Tuesday! My lashes look really really similar to your before pics so I'm hoping I have the same amazing results! I'm slightly worried that I'm going to blink loads as I have fluttery eyes! Wow! It looks amazing! It would be a perfect treat for my eyes! It looks great. I have long lashes and need to try this. I agree. Mine seem to have worn off quite quickly, which deters me from paying £40+ again. Hi i'm having this done tonight and am just worried about keeping my eyes closed for so long ..... are you able to open them a fraction if you get anxious? No you can't open them. I found the process a bit uncomfortable but bearable. Then I had a bad reaction after having it done. My eyes swelled up, went red and puffy and my eyeballs were bloodshot. My eyes were very sore and weeping. Three days later they are still puffy and sore. The dye didn't take at all on my lower lashes and has completely gone from my upper lashes. I really wish I'd not had it done. It looks fantastic on other people but just didn't work at all for me. BTW I did have the patch test and had no reaction at all.